J.U.L.I.A. - Among the Stars - R120,00 : Game Hunt, Where we lead, others follow. The story centers on Rachel Manners, a 35 year old astrobiologist. She is a member of an elite group of scientists, chosen to embark on one of the most critical missions ever conceived on Earth. Now Rachel is alone, orbiting an unknown planet. Her only companions are J.U.L.I.A., the space probe's artificial intelligence and Mobot, a huge reconnaissance robot. Together, this unlikely trio will explore the mysteries of this solar system. But are they prepared for what they will find? Step into the spacesuit of Rachel Manners and find out why she was the sole survivor of this ill-fated expedition? Utilize an ingenious MOBOT - a mobile robot designed for planetary exploration to investigate this solar system and all its wonders? Solve the mystery of the mission's failure and locate the missing crew? Travel to six unique planets and uncover their secrets? Solve puzzles, gather clues and communicate with the most temperamental artificial intelligence ever designed? 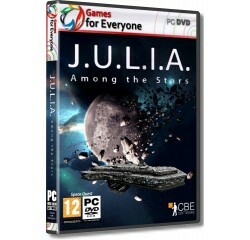 Are you prepared for... J.U.L.I.A. System - 2.0 GHz Dual Core® or equivalent AMD® processor.